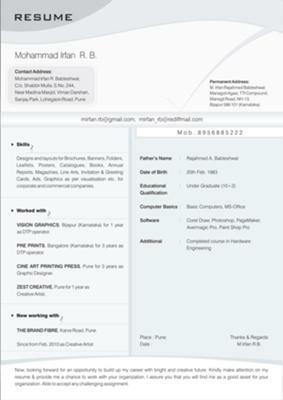 Graphic Designer Resume Sample Home of the Make a Free Printable Resume! Seeking a Graphic design opportunity to showcase my skills and provide value to your organization. I assure you that you will find me as a good asset for your organization. Yours faithfully,	M.Irfan R.B. Swimming, Drawing, Bike Racing & Chating. Employers may contact this candidate via the COMMENTS hyperlink below this page.